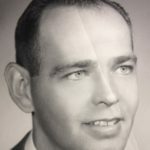 KENT– Harry A. Swartzlander, Jr., 87, of Kent, formerly of Hammondsville, died Thursday, Dec. 7, 2017, at Kent Healthcare Center. He was born August 11, 1930, in Fenelton, PA, the son of the late Harry A. and Lela (Sutton) Swartzlander. In addition to his parents, Harry was preceded in death on Nov. 2, 2013, by his wife, K. Yvonne (Bargerstock) Swartzlander, whom he married August 20, 1953. He was also preceded in death by his daughter, Beth Louise, and his brothers, Richard and Dale Swartzlander. Harry graduated from Butler High School in 1948, from the California University of Pennsylvania with a Bachelor’s degree in Education, and from The University of Pittsburgh with a Master’s degree in Education. He served in the United States Army during the Korean War. Harry was employed for twenty years as the principal of Stanton Local High School and for thirteen years as the superintendent of the Edison Local School District before his retirement in 2009. He also served for one year as the superintendent at Northern Local School District and for 14 years as an administrative assistant at Switzerland of Ohio Local School District. Harry was a member of the Irondale Masonic Lodge and Irondale Ruritan Club, as well as having served in many officer positions of the Buckeye Association of School Administrators. He was a member of the Irondale United Methodist Church. Survivors include one daughter: LuAnn Swartzlander, of Kent; one son: Harry A. “Hap” Swartzlander III of Kent; one sister, Mary Wilmer of Mt. Dora, FL; and one brother, William Swartzlander of Mt. Dora, FL. Also surviving are four grandchildren: Annie Kraus of Madison, WI; Ben Kraus of Los Angeles, CA; Joshua Swartzlander (Jessica) of Charlotte, NC; and Allen Swartzlander of Kent; and seven great-grandchildren: Jenna, Jolie, Jillian, Jaxzen, and Journey Swartzlander of Charlotte, NC; and Oliver and Parker Swartzlander of Kent. The funeral service will be held at 12:00 pm Saturday, December 23, 2017, at the Roberts Funeral Home with Pastor Dan Crowe of the church officiating. Burial will be in Worthington Presbyterian Cemetery in Pennsylvania. Friends may call from 10:00am-12:00pm Saturday at the Roberts Funeral Home, 631 Main Street in Wellsville. In lieu of flowers, the family asks that memorial donations be made in Harry’s name to The Alzheimer’s Association at www.alz.org.